David Coulthard, the former Williams, McLaren and Red Bull driver who became the highest-scoring Briton ever to drive in Formula One, has received an MBE in the Queen’s Birthday Honours List. 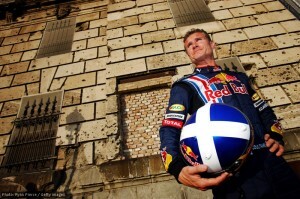 David Coulthard on PR duty for Red Bull in Hungary, 2009. Coulthard, 39, is now presenting the BBC’s Formula One coverage as well as acting as a consultant to Red Bull and driving for the first time in the Deutsche Tourenwagen Masters (DTM) touring car championship. According to statistics released by Red Bull on his retirement at the end of the 2008 season he has taken part in 246 Grands Prix, enjoying 13 wins, 62 podiums, 18 fastest laps and 12 pole positions. His best championship finish was second in 2001 and he scored 535 points. His appointment as a member of the Order of the British Empire sees him honoured in the same fashion as recent British Formula One world champions Lewis Hamilton and Jenson Button, who received their awards in December 2008 and December 2009 respectively. Other people honoured this time around include actors Catherine Zeta Jones and John Nettles, winter sports Olympian Amy Williams, the founders of the charity Help for Heroes and cookery writers Prue Leith and Marguerite Patten.  For a full profile of David Coulthard and his career to date, click here. Categorised under News, tagged under David Coulthard, Formula One. F1: Adrian Newey to quit?